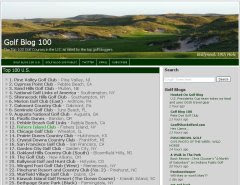 I couldn't let Jimbo's fledgling Golf Pic of the Week (http://golfpicoftheweek.blogspot.com) have all the fun. 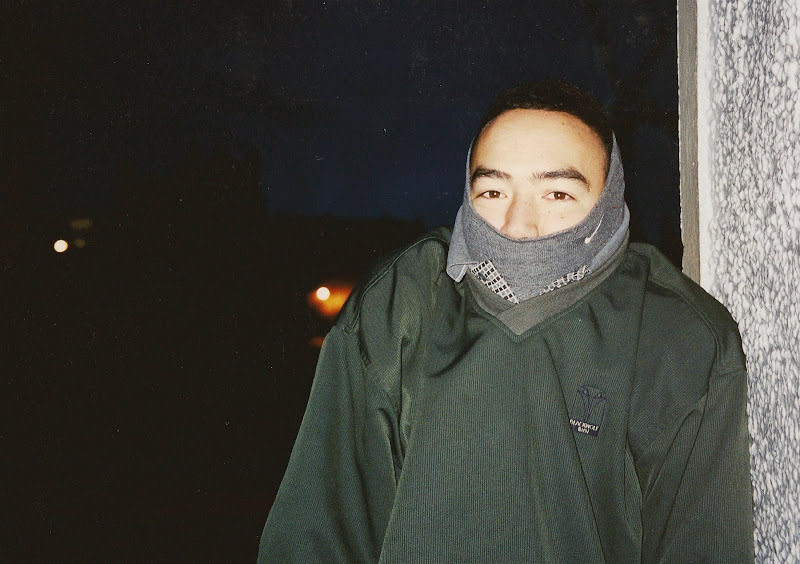 Here are some ol' pics from the archives. Remember the days when you had to develop film and hope for the best? I have an old briefcase full of pictures -- probably 35 rolls of film and these are the only decent ones in the whole lot. Unlike the 'High-Quality Golf Pictures' found over on GPW, these pics aren't that great (and I apologize for the red-spot on each one. If you think I'm rescanning all of them, you're crazy.) Hopefully, I can make up for it with 'Semi-Intelligent/Snappy Commentary'. Enjoy! You may not recognize him without the Nike hat, but that's me with none other than Eldrick 'Tiger' Woods. 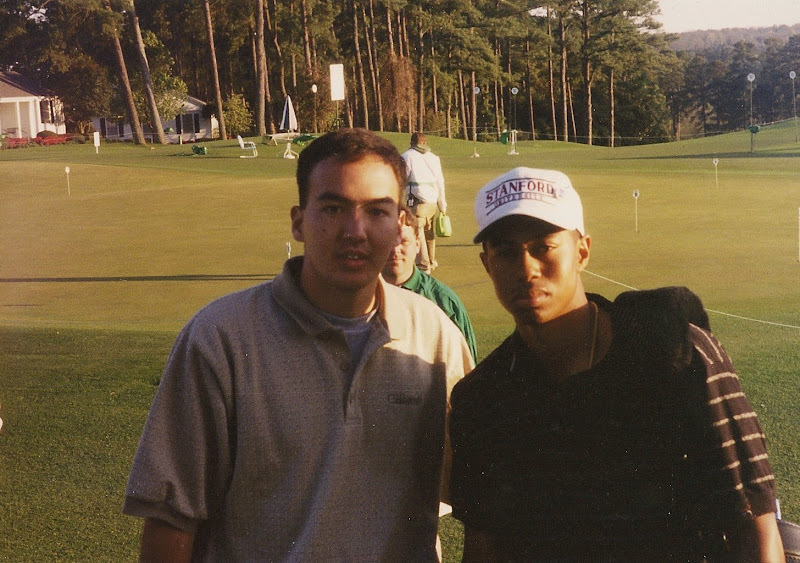 This is at the Masters in 1996 after the Tuesday practice round. Twelve months later, Tiger would be lapping the field in his epic 'win for the ages'. But in this pic, he's just a kid from Stanford lugging his own bag off the putting green (he wasn't the only one skipping class that day...I was in my last semester in school and decided to road-trip down to Georgia for a few days with Jefe). Imagine trying to get a picture with Tiger today? First, he's got the blinders on at all times, so he would never even see you in the first place. Second, Stevie would take your camera and beat you over the head with it. By the way, I don't think either Tiger or I have ever looked worse in a photograph. Part of me hopes that Nike sends me a cease and desist order. 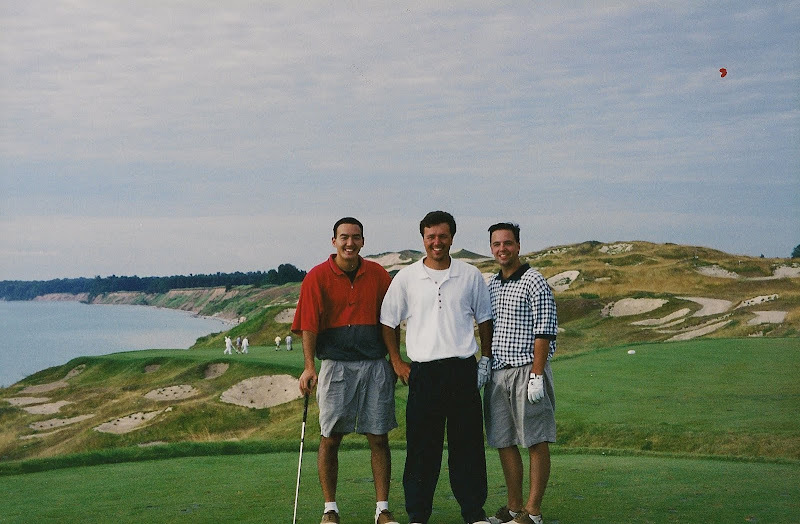 This is hands-down the best picture of the Triumvirate, circa 1998 on the 3rd Hole at Whistling Straits. That's a good-looking crew. Notice my XXL red-grey Tiger Woods golf shirt? I got that in 1997 at the Western Open -- the same event where we got the famous shot of him walking down the 18th fairway wearing the same shirt with the gallery swarmed behind him. I must've played well with this shirt because it became my 'Go-To' shirt for any meaningful round. Trust me, it will become apparent in a second. I remember this day vividly...it was August 9, 1995. World Woods, Rolling Oaks. I would pay good money to have this head of hair back, but the shirt can stay in the 90's. I'm amazed that my clubface looks five degrees open at the top. The same pic today would show a clubface that's 10 degrees closed. 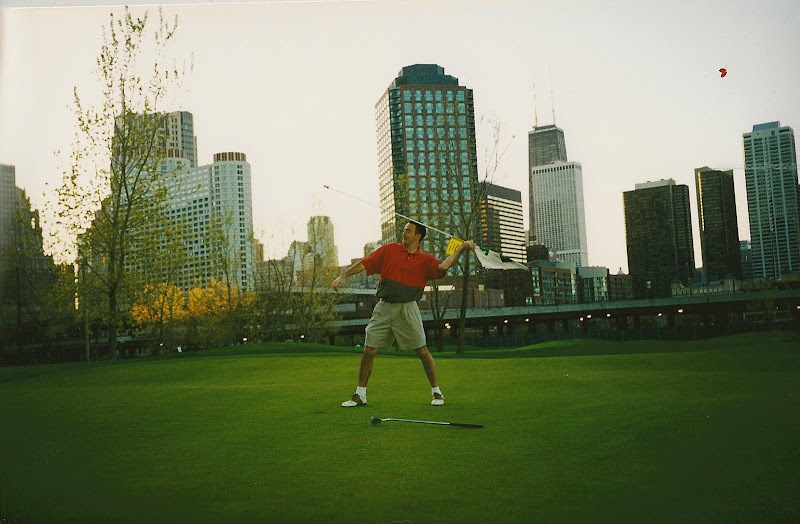 Here's a pic from our first ever golf trip. 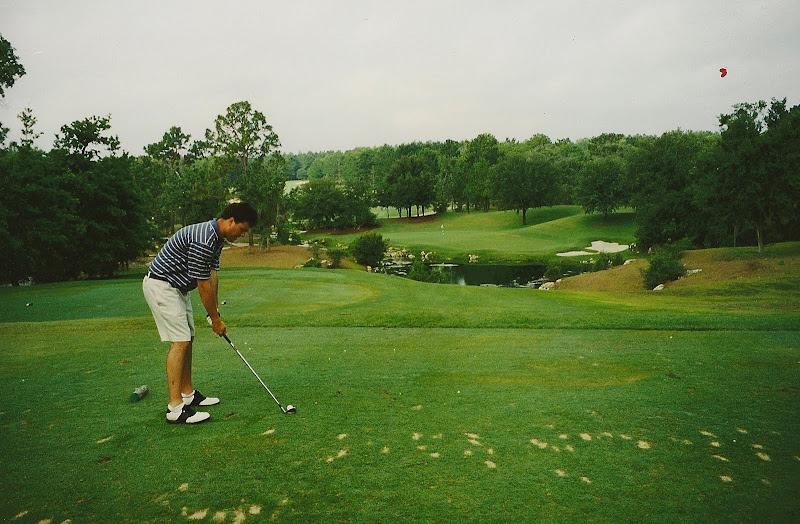 My buddy Wego is teeing off at World Woods - Pine Barrens in 1993. We were there for spring break our freshman year in college, thanks to the generosity of my grandparents who live nearby. I'm only posting this picture from the trip because I couldn't find the one I was looking for. I have a great pic of Jefe hitting on the 8th Hole at Rolling Oaks, with Wego digging in his pocket for a quick breakfast ball. 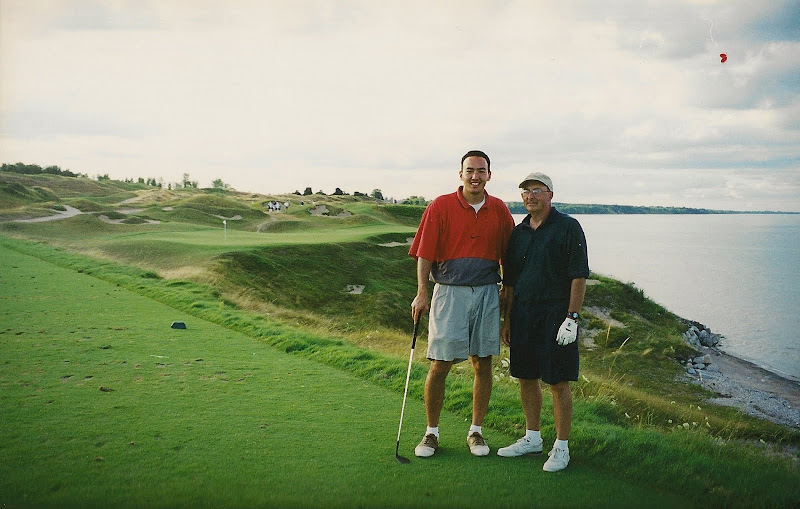 Here's my father-in-law Ken and I at Whistling Straits in 1999 (the last time I've ever played the Straits...what does that tell you about their $400 greens fees?) Ken's giving us the 'I can't believe my daughter's marrying this bozo; I guess I have to be nice to him' face. Ten years later and his face still looks the same! 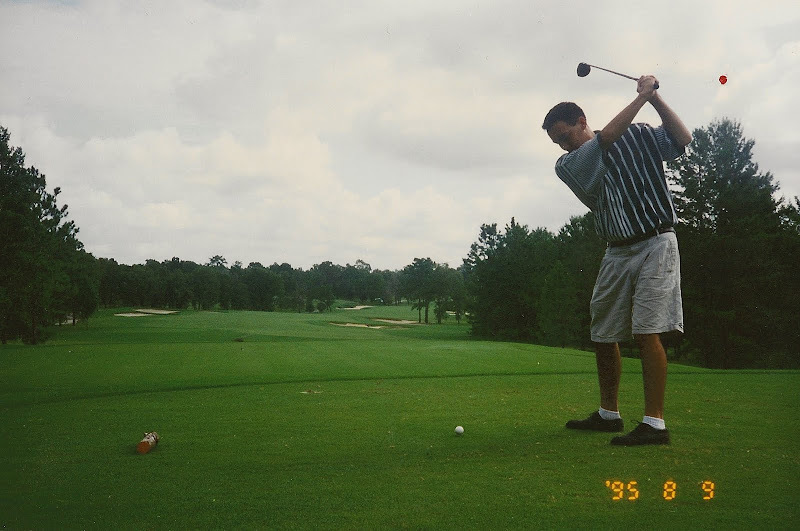 The 'utter-butter' swing, as Jimbo calls it, hasn't changed much over the years. 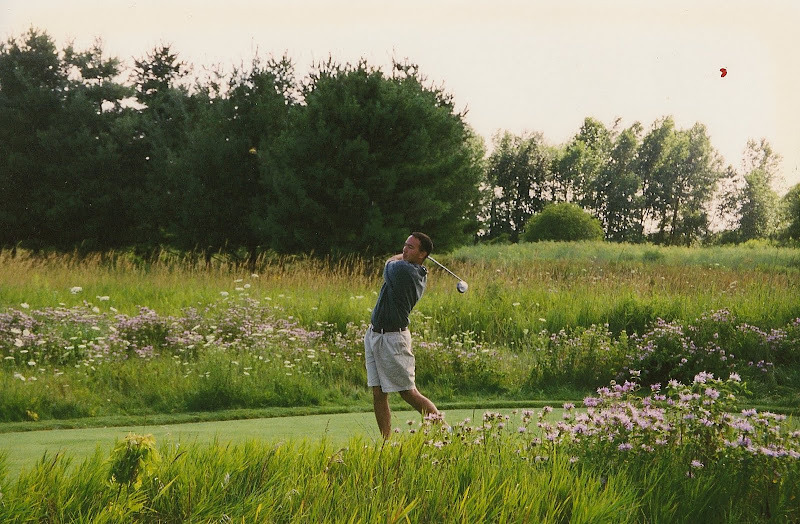 This is at Blackwolf Run Meadow Valleys, I'm going with 1998. 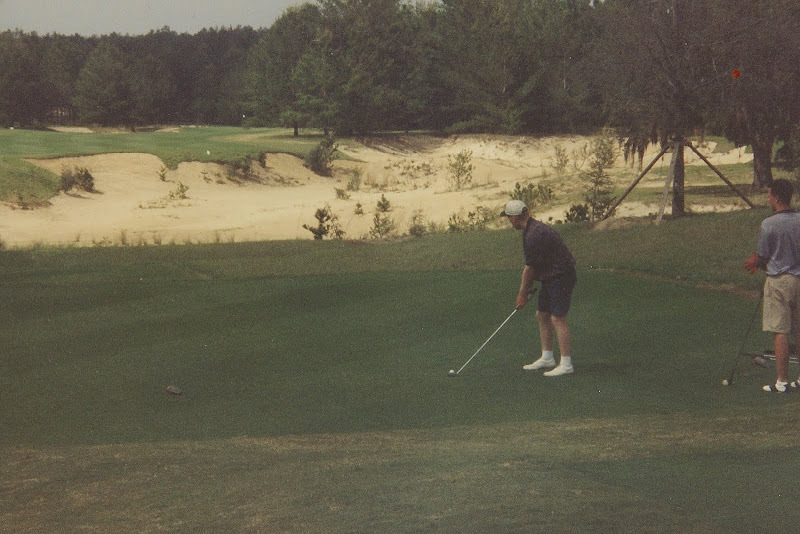 Kemper Lakes, 17th hole on September 3, 1999. 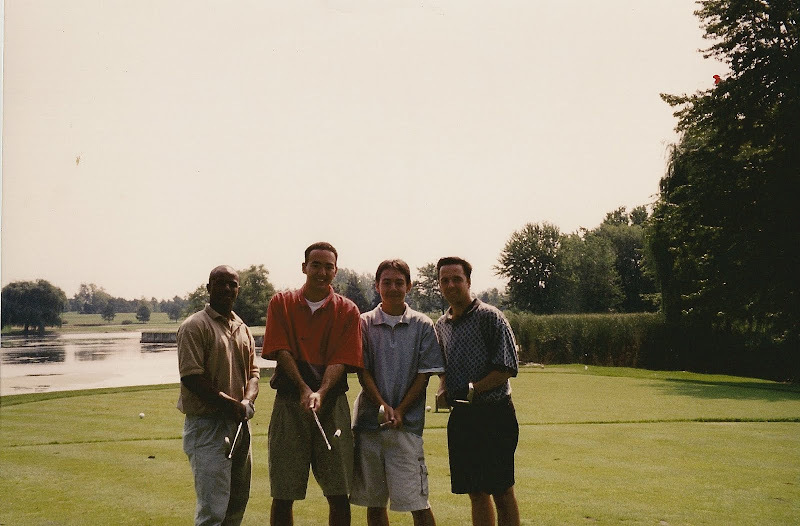 This is the day before my wedding day, with my buddy Charles, younger brother Jason and Jefe. My bride-to-be was playing also. My brother and her friend rode along and the nice folks at Kemper Lakes decided to charge them a $30/per person cart fee for the privelege. And yes, I birdied the 18th hole -- my last hole as a bachelor. It's been all downhill since. The golf, not the marriage. 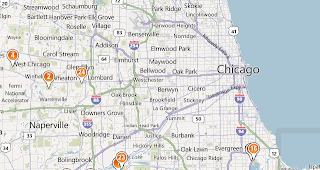 There used to be a par 3 course just north of the loop. I can neither confirm nor deny that I chose my first apartment because it was on the 23rd floor and it offered a view of this golf course. 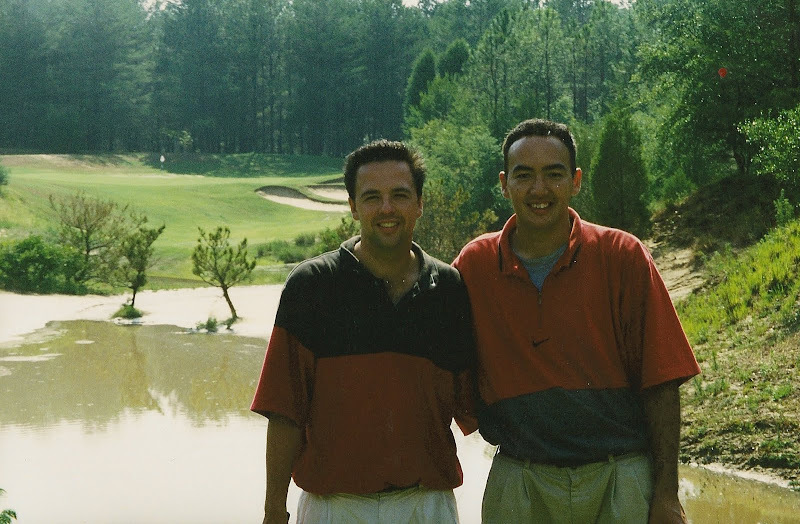 Jefe and I at the 16th hole at World Woods Pine Barrens, circa 1999...the first of many ambigously matching shirts (unintentional, I swear). There isn't a water hazard on this hole, we were treated to a torrential downpour in the middle of the round. 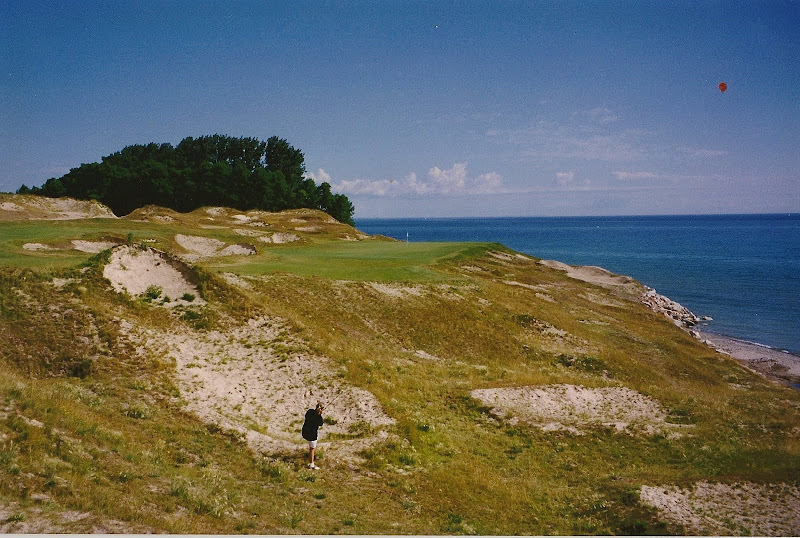 Here's my beloved wife on the 13th hole at Whistling Straits in 1998. This picture is significant not because of the hole or the course, but because it's the only documented footage of her ever missing a fairway. 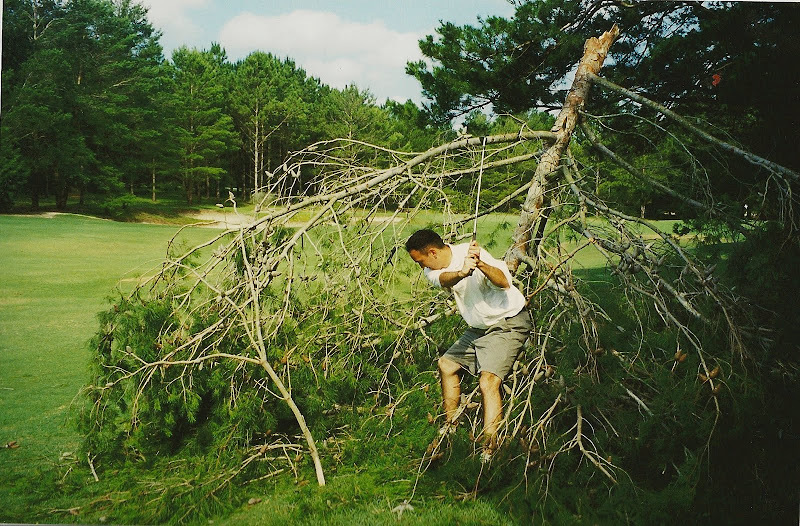 A tough lie at World Woods. I'm pretty sure Jefe instituted the Shooter McGavin "Play it as it lies. I hit it off Frankenstein's fat foot." section of the rulebook. Jimbo on the 8th Hole at World Woods Rolling Oaks. Normally, I would take this opportunity to take potshots at my blogspot competitor. 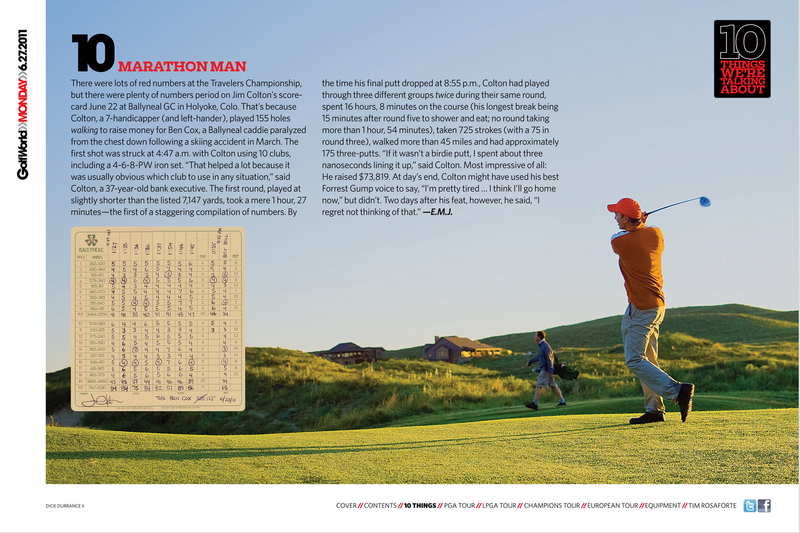 Likely it would be something about his hair, his swing or the fact that he's probably hitting 4-iron on this 145-yard downhill par 3 (only because hybrid clubs hadn't been invented yet). But I'm going to take the high road. 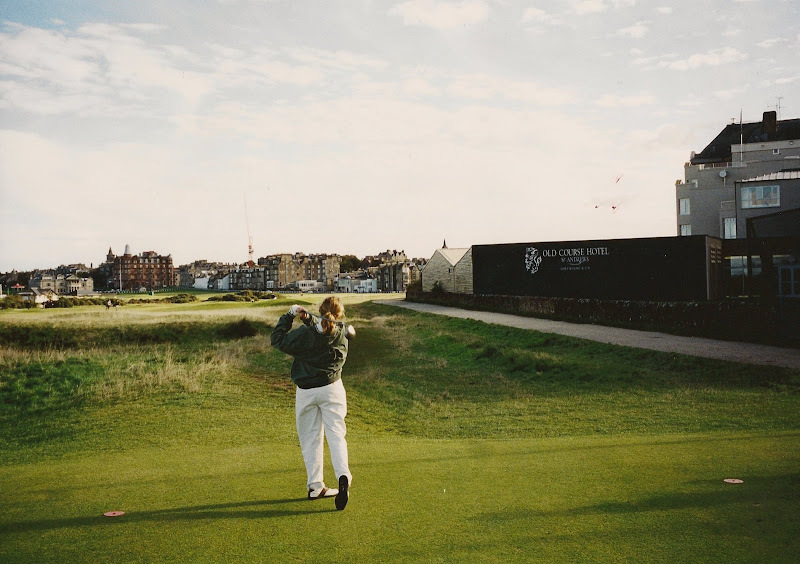 I dug up some pics from St. Andrews in 2000. Enjoy! My wife and I both worked in London for a six-month stint before we had kids. The day after we arrived in London, we were on a flight to Edinburgh to head to the Home of Golf. 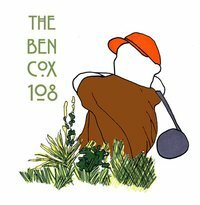 Unfortunately, the Old Course was closed because Sean Connery was having some sort of celebrity pro-am there, but we played the other Links Trust courses. 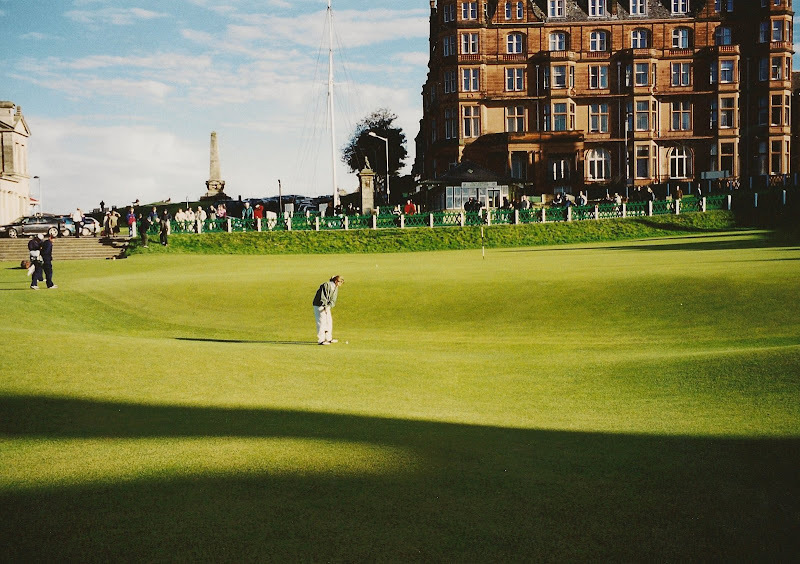 The cool part of the Old Course is that it's essentially a public park -- a public park that doubles as one of the great golf courses in the world. People mill around, walk their dogs, take pictures on the Swilken Bridge, etc. Try that at Augusta National. 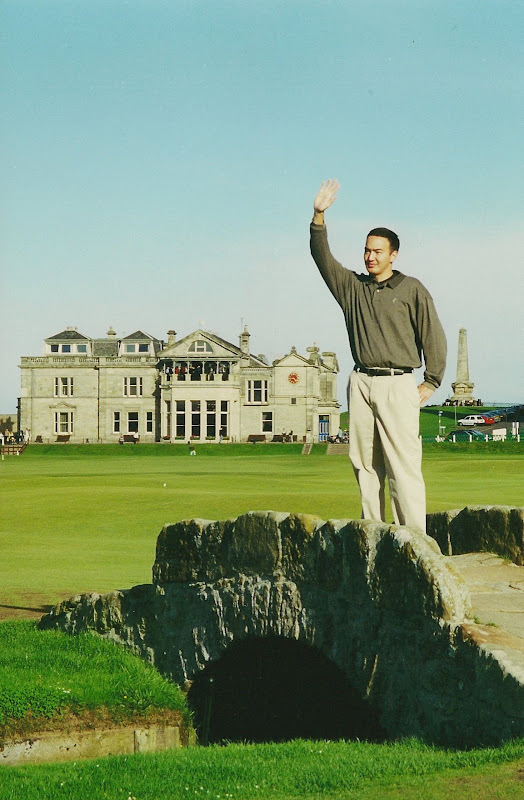 Remember how Jack milked two British Open farewells on the Old Course, in 2000 and again in 2005? Here's my impersonation of his first farewell. Undeterred, we went back to St. Andrews a month later for my birthday. We finally got to play the Old Course, but had to do wait outside in 45-degree temps for five hours in order to do it. I promptly double-bogeyed the first five holes. My wife was paired up with three American hacks about three groups after me. She waxed all three of them. Here is Sue teeing off on the famous Road Hole. Sue got up and down from the Valley of Sin. See all the people milling around just watching the golf action? My wife got a polite golf clap when she holed her 10-foot par putt. My rampant Middle-Child Syndrome kicked in at that moment, wondering why I got no credit for my routine par 30 minutes earlier.